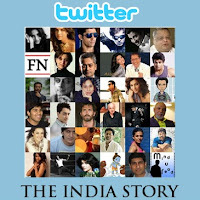 The India Twitter Story: The Story you never knew about! The moment @kjohar25 reads this Superman Post he forwards a copy to SRK on his email id. SRK reads it and thinks what the hell. I too want to be Superman and then instantly announces to the world the very next day “I AM SRK and I want to be Superman “. Also meanwhile the headquarters of Twitter notice this strange surge in traffic to twitter because of the Superman Post. They are excited at first but then realize that it might crash their servers. They decide to ban the word Superman from twitter. @iamsrk who likes to be number one in all things in life wants to be number 1 here too. Hrithik feels inspired and calls himself @iHrithik He wonders what to write about and starts giving tips about body building. He soon runs out of stream. @Shahidkapoor who is a big fan of @iamsrk decides to ape him and he also starts speaking philosophy like him. He continues to make fuss while suddenly there is another post from @KartikDayanand via @Minduread called 3 Idiots : Confusing a Nation! Once again @PritishNandy reads it and loves it, he re tweets this post to his now growing followers which has few more influential people from media like @BDUTT @sardesairajdeep @virsanghvi and @sagarikaghose. Same sentiment is shared by @taran_adarsh too, he does not know what hit him. Menwhile @chetan_bhagat thinks his issue is like a non issue in front of the new 3 idiots post. He makes a silent retreat and starts talking about lord Krishna and also takes a sabbatical from twitter. He feels lost. Same is the case with @1mrankhan who is the nephew of Aamir Khan, he coaxes Aamir to make a statement on the 3 idiots post but to no avail. Not knowing what to do he too makes a great escape from twitter and goes underground. He quickly adds an extra H in kartik to make it sound heavier and calls his movie Karthik Calling Karthik so that there is no doubt left as to who the really popular one is. @priyankachopra also manages to become the brand ambassador for the NDTV greenathon event. This upsets Aishwarya Rai and she coaxes Abhishek to do something similar. @juniorbachchan bombards twitter with messages to his followers asking them to follow earth hour and to tell everyone they know about it, just like in the movie. Hope i could open your eyes to the truth behind the influx and activities of the who’s who of Indian Tweeters!